Almost two years ago (has it really been that long?) I wrote an article titled, “What’s In Your Laptop Bag?” It contained an exhaustive list of things I carry with me everywhere when I’m traveling to conferences or out-of-town meetings. Today, I was looking around my home office and realized that it might be useful to do another one documenting all of the gear I have at my desk. (I work from home, so this is the dedicated space in my house where I work every day.) There’s another reason I’m writing this, though, and it’s because I received so many great responses and recommendations from the last article. I’d love to hear what’s important enough to keep on your desk, as well as your recommendations for the “weak spots” in my setup. When I decided to work from home 6 years ago, I decided to invest in a good chair. In my days working for advertising agencies, I had fallen in love with the comfort and durability of the Herman Miller Aeron Chair, and splurged on one for myself. No regrets whatsoever. Under the chair, I started with plastic chair mats, but they ended up cracking and chipping away. I recently picked up an Anji Mountain Roll-Up Bamboo Chairmat, and couldn’t be happier. It’s gorgeous, durable, and is much easier to move than a giant plastic mat. 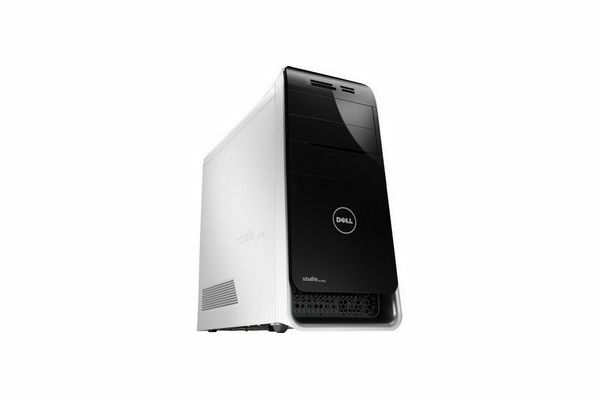 I’m currently using a Dell Studio XPS 8100 that I’ve had since March 2010. Three years is usually my limit on hardware, but I loaded this one up when I bought it, and it’s still going strong. I also added a bigger video card (two years ago) for the time that I was still trying to play World of Warcraft. 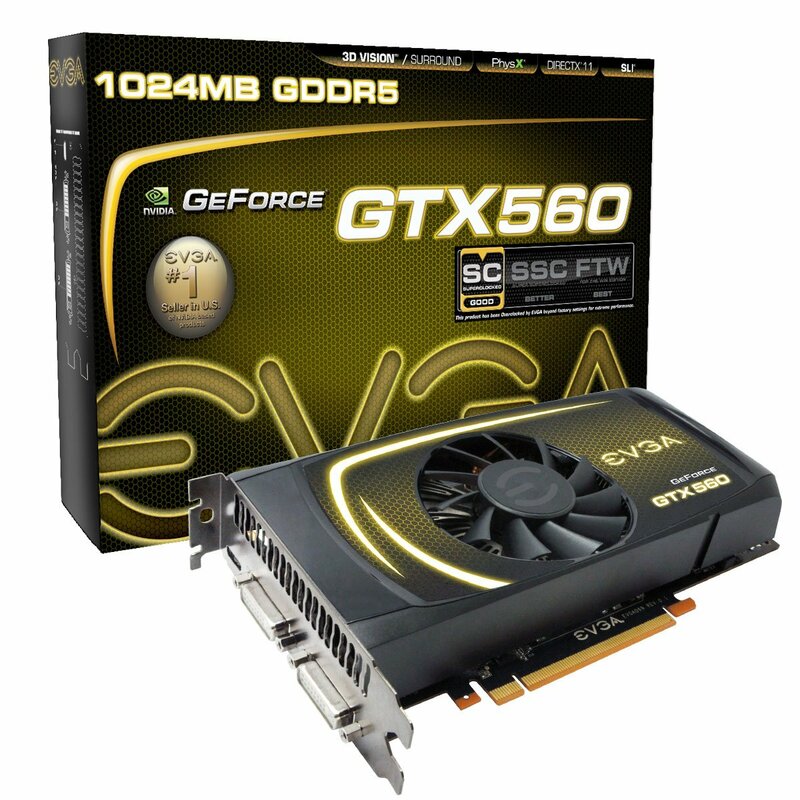 Those days are far behind me, thankfully, but this is the GeForce GTX 560. I’ve been running some kind of dual monitor setup for almost ten years now, so when I’m forced to just work on a laptop natively, it’s painful. That being said, monitors seem to last forever anymore, so I’ve had these two for 5-7 of those ten years. 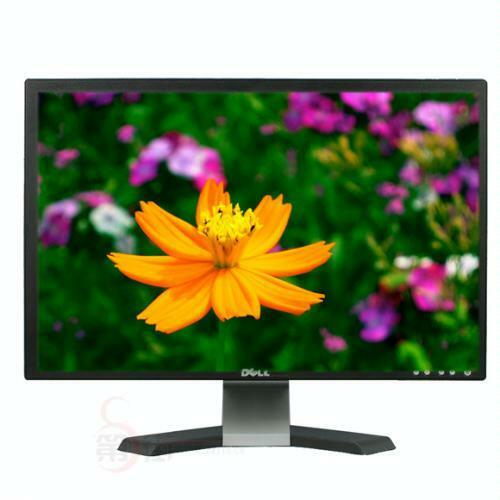 The first one is a Dell 2408WFPb 24” monitor. 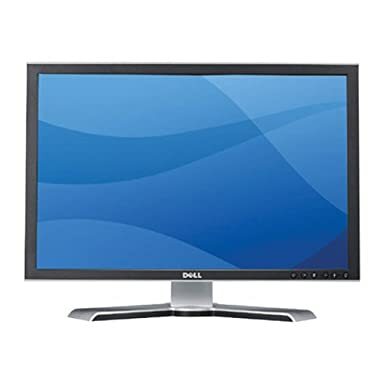 The second is a Dell E228WFPc 22” screen. I’ve held on to this smaller one for a while, only because it supports much higher resolutions than most of the monitors on the market right now. I’ve also been using this for several years now (probably 4), and it’s on my list of things to replace. Not because it doesn’t work, because it’s excellent, but mostly because of the microphone. I’ve been doing more conference calls and podcasts, and it just picks up way too much ambient machine noise from around my desk. In general, however, it’s an excellent webcam for a reasonable price. This is the Microsoft Lifecam Cinema. As part of the security measures at Microsoft, I need a smart card to access our internal network. 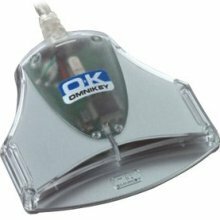 The Omnikey 3021 Reader gets the job done, without being very large or inconvenient. It fits nicely under my primary monitor. On each side of my monitors, I have installed in-desk USB hubs. Underneath the desk, they’re powered, and connected directly to the desktop machine. They’re only USB 2.0, but for everything I’m currently doing, I haven’t seen the need for USB 3.0 yet. There’s also space on either side of the ports to run cables through the desk. Excellent design. 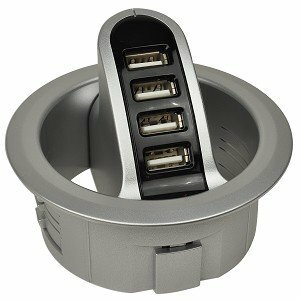 While this one is no longer manufactured, you can get the similar Belkin In-Desk USB Hub for about $35. 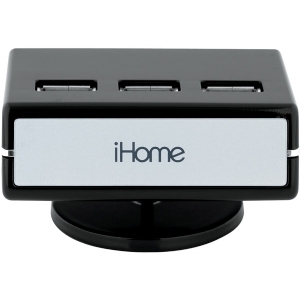 I am also running an iHome 7-port USB hub behind my monitors for the webcam, keyboard, smart card reader, and other USB accessories that find their way to my desk. I’ve also added a Sunway PowerTap into my desk’s surface. 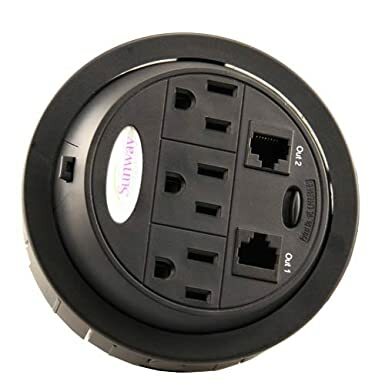 It adds three power outlets, and two wired network connections, making it easy to plug a machine in temporarily on my desk without having to run a bunch of wires underneath. This is one of the most recent additions to my office, the Logitech Performance MX Mouse. I love it for several reasons. First, it’s very accurate. Some of the cheaper mice (even wired ones) that I’ve used in the past have been difficult to use for precision work like Photoshop. This is top-notch for that. Second, it is super comfortable in my hand. Finally, it has solved the problem that so many wireless mice in the past have been plagued with: it has a rechargable battery that can be charged while you’re using it. Just plug in a micro-USB cable to the front of it, and you’re back up and running. An exceptional mouse. I have tried literally dozens of keyboards over the past few years, but none of them have justified the price. I’m actually still using the default keyboard that came with my desktop machine. It’s nothing fancy whatsoever, and I’m still looking for the keyboard that will change everything for me. Until that time, however, I’ll stick with the Dell SK-8165. A few weeks ago, my headphones broke. They still worked, but the part that goes over the top of your head snapped, making them unusable. I spent a few weeks looking around for a replacement, and fell in love with the Beats by Dre Studio Over-Ear headphones. They’re the first noise-cancelling headphones I’ve ever owned, and the sound is excellent. (Not to mention they come in obnoxious colors, like the orange ones I got.) They also completely surround my ears, which means I can wear them all day without my ears starting to hurt from the pressure of them pressing down. Sometimes, you want more than headphones can offer, and you want to listen to music without wearing headphones. For this, I’ve had a trusty set of speakers/subwoofer for years. 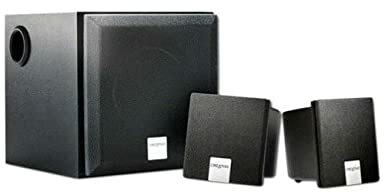 They’re not for sale anymore (the speaker business seems to churn quickly), but the Creative Inspire 2.1 2400 are plenty to fill my office with enough sound to get my wife to knock on the door and tell me to turn it down. Because this is my home office, and I’m super lazy and averse to wires laying everywhere, I’ve also grabbed an audio switch to jump back and forth between the headphones and the speakers. I actually mounted it right under my desk, so when I reach down to toggle the button on the switch, I feel like a Bond villain reaching to open the trap door. (OK, maybe not.) 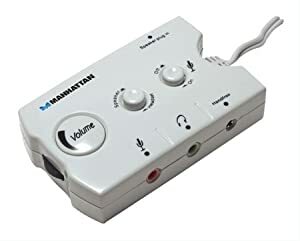 It also has a volume dial, so it’s easy to modify the volume of my system without having to jump to some menu on my system. One of the best purchases I have made for my office, and it only cost $15. I do a bunch of mobile development, and in many cases, I need to test my software on a physical device. This little stand can often be found as a giveaway at conference sponsors booths, but you can also pick one up on Amazon if it works for you. It’s the Blue Lounge Milo Phone Stand. It uses “micro-suction” to adhere both to the desk and to your device, and it really works. When I was writing this section, it took me about 5 minutes to get it off of my desk. The only real downside to this stand is that my Nokia Lumia 920 needs to be plugged in to transfer my software to it, and the USB port on the phone is on the bottom. Getting it plugged in and sticking to this stand can be tricky, but it can be done. Working from home, I don’t want to have to use my cell phone for all of my calls. (Yes, this means I still have a home phone number, don’t judge.) I wanted a phone that was cordless, took up minimal space, and offered a speakerphone function because I hate holding a phone to my ear. The VTech DS6321-3 DECT 6.0 Cordless Phone package did the trick. It comes with 3 handsets which don’t require a phone cord (except for the primary base, which is elsewhere in the house.) It has a tiny footprint on my desk, but gets a ton of use. It also has a nice feature (which I don’t use) that allows you to connect your mobile phone to the primary base via Bluetooth, so that when you’re home, you can answer your mobile phone from any of the handsets. It even uses a different ringtone, so you know which phone is ringing. I seem to constantly need to scan in a business card, a signed document, or just a photo, and I don’t want to have to walk across my office to the big print/scan/fax/copy combo. I picked up the NeatReceipts Scanalizer Pro a few years ago to catch up on all of the business cards that were cluttering up my desk. It comes with some great software that does OCR, and imports that data directly into my Outlook contacts. Very convenient. It sits vertically on a stand behind my monitors, but is in easy reach when I need it. As you can tell from the length of the list already, I have tons of cables on my desk, and I’d rather have none. To contain the chaos that is the wiring at my desk, I’ve been using Blue Lounge’s CableDrop cable clips. They’re adhesive, so they’ll stay where I want them to, and they grab and hold the cables I put in them. They’re great for keeping my keyboard wire in one place, my smart card reader in easy reach without moving all over the place, and even for running the wires directly under my desk instead of just hanging everywhere. Highly recommended. They come in a bunch of colors, but the ones I’ve been using are white, brown, and orange. As I mentioned earlier, I do a bunch of mobile development, and this includes all of the platforms: Windows 8, Windows Phone, Android, and iOS. In order to build apps for iOS however, you actually need a Mac to do it. This is why I picked up a Mac Mini (with 8GB of RAM), which lives behind my monitors, and is a simple input toggle away. Visual Studio (with Xamarin) connects directly to it, which makes development a snap thus far. I also picked up a Magic Mouse and Apple Wireless Keyboard for the Mac, mostly because they’re convenient, but also because I haven’t had much luck with KVM switches in the past, and for as rarely as I’ll actually need to use them, that seemed like significantly more work. They work great, but the Magic Mouse really doesn’t compare the mouse I’m currently using, and the keyboard is a little small for my everyday use. I’m accumulating quite the collection of tablet devices in this office, but there are three specifically that have a permanent place on the desk. First is the Microsoft Surface RT. I added the white Touch Cover, but mostly I use this device to test my Windows 8 apps that I’m building. Visual Studio can connect wirelessly to the device for debugging, so I never need to move it. In addition to the Mac Mini, I also have an iPad with Retina Display. This serves several purposes for me. First, it has a retina screen, so I can see what my websites look like at this resolution. (Usually not great.) Second, I can deploy my iOS apps that I’m working on to this device for testing. Finally, as a dedicated Microsoft guy, it has become a research tool for me. I now have the ability to see what all the hype is about with certain apps I hear about that might only be available for iOS. So far, the apps have been the only differentiator from my Surface RT. A mobile development environment wouldn’t be complete without an Android device, and while I acknowledge that there are literally hundreds of Android form factors out there, I picked the Google Nexus 10 32GB to be my reference device. Thus far, it’s been the tablet I’m least likely to pick up, but I’ve only had it for a few weeks, so time will tell. For the iPad and the Nexus, I wanted a simple way to make the accessible while charging. That’s where the Belkin FlipBlade comes in. It’s a strong but lightweight tablet stand that adjusts to several different angles. It also folds up flat for when you want to throw one in your laptop bag. When I’m working from home, I rarely touch my laptop, but I’ve made a place at my desk for it simply so that I remember to update it, install software when I need it, and so it doesn’t just gather dust in my bag. This is the machine that goes everywhere with me on the road, however, so it needs to be up-to-date. This is the Lenovo X1 Carbon Touch. Finally, for the last item in the list, there’s the laptop stand. This is where my laptop lives when I’m home. I use the Griffin Elevator Laptop Stand because it creates a place my laptop should go, it’s beautiful, and it leaves plenty of space for things below it. So that’s pretty much everything on my desk. At least, that’s everything related to technology that’s on my desk. I’d love to know what you’ve got on yours, and how it makes your work as a software developer easier. Link to your article in the comments, or just send me an email if you’d rather not share it with the world. Thanks Jeff, I have now borrowed several things from your list that would benefit my own home office…my wife will not be pleased haha. I’m impressed that with the amount of gear you have, it is still well organized. Well done! Looks like I’ve got to head down to Cincy and visit the IKEA now. Thanks, Jason. I don’t have anywhere near the gear you do, but I make up for it with a crapload more dust and junk on my desk. So there. I’ve had ergonomic issues some years ago, so my most important things are my Aeron chair and Humanscale keyboard tray (http://shop.humanscale.com/products/product_detail.cfm?group=KeyboardSystems) That Humanscale tray is very spendy, but it’s worth every cent. Highly adjustable and extraordinarily stable. There’s no bounce to it at all. I also prefer a trackball vs. mouse, but that’s just me. My current setup is a Logitech Trackman Wheel, but apparently they’ve stopped making those. Get off my lawn. I use one main monitor, a 27″ LG monitor with good resolution. My laptop sits in a Humanscale laptop holder (http://www.amazon.com/Humanscale-Notebook-Managers/dp/B001IM5VIU/ref=sr_1_2?ie=UTF8&qid=1369945788&sr=8-2&keywords=humanscale+laptop+stand) and acts as a second monitor. The Humanscale holder is expensive, but awesome–especially the cool little copy holder for easy transcription. When I’m doing product videos I want really good audio on them, so I use an Audio Technica AT2020 mic with a boom, spider mount, and a pop shield. It’s moderately expensive, but the audio quality is extraordinary vs. the headset. The only other stuff I’d mention are things around keeping my head on straight while I’m isolated in my home office. Aside from the scotch, that is. First off, I have a digital photo frame loaded up with stuff from vacations, etc. Invaluable. There are ten billion variants, so find one you like–but it’s awesome. You already covered good audio gear, though I find myself leaving music off to enjoy the silence. I keep my guitar on a stand within arm’s reach for short noodling sessions when I need a five minute break. Finally, I’ve got a Keurig coffee machine right behind my desk. Handy, but as a result I’m roasting less coffee because the Keurig’s too easy. I miss my really good stuff, but I’m trading excellence for convenience. Not everyone’s such a fanatic, obviously. Argh. Totally forgot one very critical piece of ergo equipment for me: The Microsoft 4000 Keyboard. This is an extraordinary keyboard. Nice features, WONDERFUL feel, great adjustability. The split board and good palm rests are teh awesum. The split keyboard takes some getting used to, but I’ll never go back. For me the critical extras are my mini-fridge for my diet sodas, my water cooler and my microwave oven. I really don’t have to leave my office much except an occasional bathroom break. Of course my Fitbit is quick to remind me that I don’t leave my office much. As far as computer tech, I really must invest in a better webcam. I am using an old XBOX Live Vision Camera. Is is ok but could be much better. My laptop is the only machine for me. I am on the road almost as much as I am at home so I got a machine that could serve as both a desktop and travel machine. 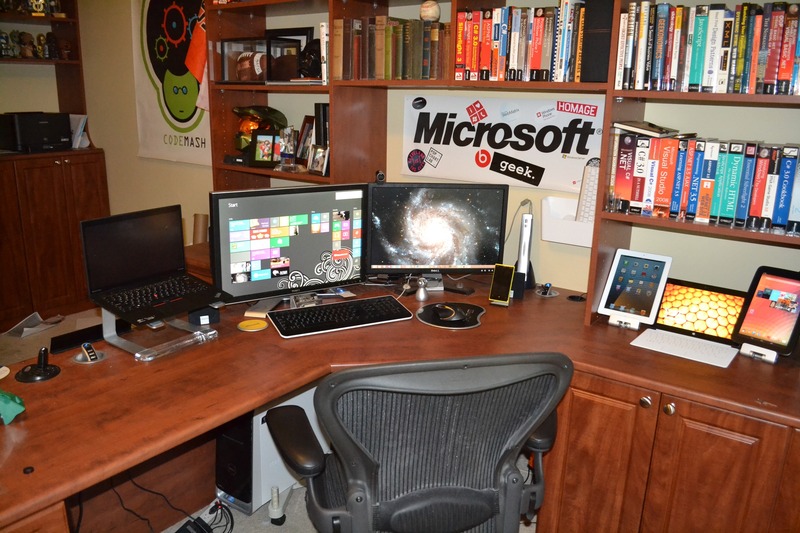 I sport a Samsung Series 9 15″ laptop with 8Gb Ram and 256Gb SSD. I also have a 1Tb external drive that keeps all my media files and downloads to keep my SSD free for applications and OS. For traveling I found that the Arc Touch mouse is great. Fits nicely in the bag and works well enough for day to day use. Nice list. Thanks for putting it together. But I gotta say, that seems extravagant for a chair. The price tag for a good chair may be high, but you wouldn’t balk at buying a computer that costs twice as much and lasts half as long. 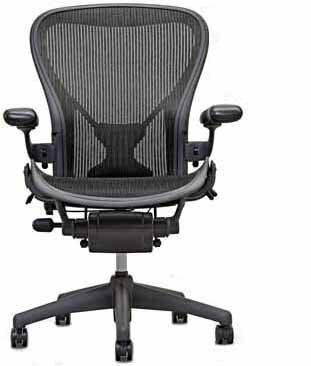 If you are sitting in that chair for 2000 hours per year, and it lasts (a conservative) five years, this thing will cost about $0.10 per hour to never have a hurting backside, an aching back, or numb legs. Is there a U.P.S. hidden under there somewhere? My MBPr is my daily driver which has its own battery. But, the monitors, cable modem, and wireless router are all plugged into the U.P.S.